The sixth and final single to be released from the Hysteria album in the UK. It was released on 30th January 1989 reaching Number 15 on the singles chart. A song which referenced many of the band's early musical influences from the early 1970s Glam period including Elton John and David Bowie. The follow up to 'Love Bites' which had reached Number 11 in July. The single released on regular 7", 12", CD and cassette featuring a new B-Side called 'Release Me' and a live version of 'Rock of Ages' from Tilburg, Holland. 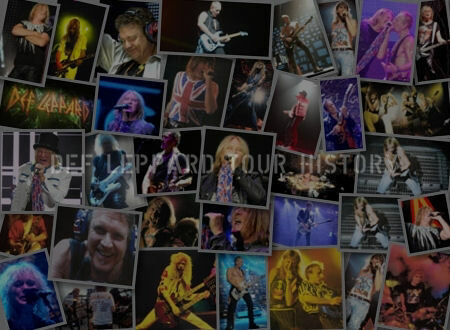 This song was jokingly recorded during the 'Hysteria' B-Side sessions in February 1987 with Steve Clark's roadie Malvin Mortimer on guest lead vocals. The song was billed as being by Stumpus Maximus And The Good Ol' Boys. Malvin being Stumpus and Def Leppard as the backing musicians. 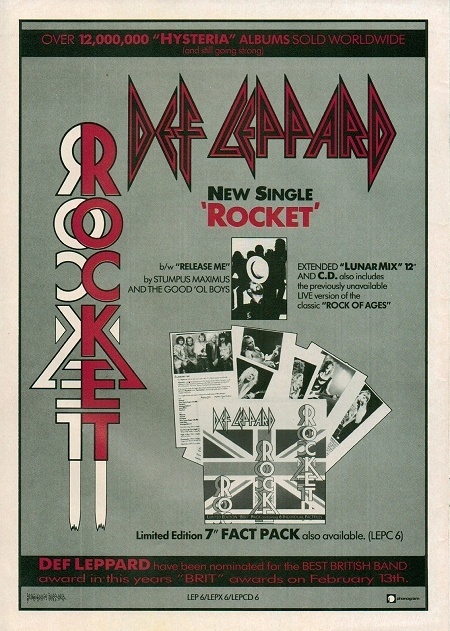 The CD, 12" Picture Disc and 7" 'Brit Pack' box versions included three different versions of 'Rocket'. The main single edit, extended mix and radio edit. The main edit and extended versions were billed as 'The Lunar Mix'. 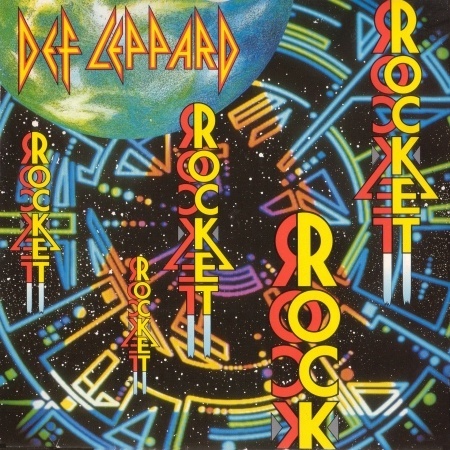 The two other versions of 'Rocket' were the regular album version and a shorter extended mix of 7 minutes that was released with the 'Love Bites' CD single. 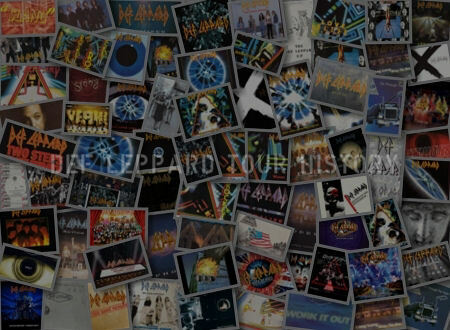 This sixth UK single featured custom artwork using the back cover of the 'Hysteria' album. 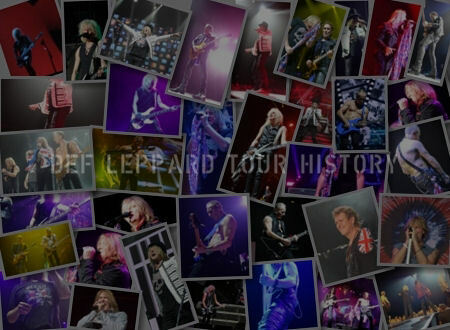 'Love Bites' had been intended as the final UK single and was the last of the album cover segment singles, meaning only five UK singles could be used to make up the full cover art. "It’s sometimes compared to Adam & The Ant’s or the Glitter Band because they both made an effort to feature the drums. In fact. The idea came from an African band called Burundi Black. I first heard them while having a meal on a barge in Holland. I borrowed the tape. Took it to the guys and they loved it. The band took the ball. Ran with it and made it sound fantastic. Even making the mid-section sound like an updated version of ‘Whole Lotta Love’. Lyrically. We namechecked everything from our youth: There were references to artists diverse as Lou Reed to Elton John. A real team effort." "Probably our most adventurous song. 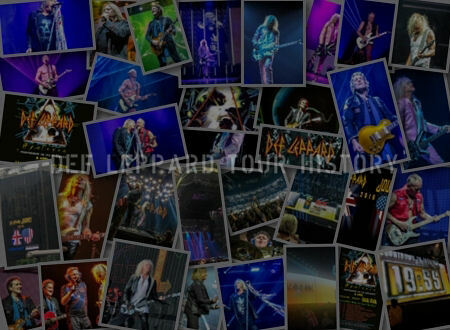 It’s also my favourite of ours to play live."